Unexpected news today that Johnny Vaughan is leaving Capital FM’s Breakfast Show after eight years. Nowhere near the longevity of his predecessor, Chris Tarrant! It seems he’s leaving with immediate effect. Not that it bothers me, really. At that time of day, I’m at work and the radio station on in the background is very rarely Capital. Often, though, it is another one with the same kind ‘personality’ led music show: a bloke and girl combo where the bloke is the funny one and the girl is the ditzy sidekick who has to laugh at all the bloke’s gags and well-rehearsed ad-libs and one-liners. Crapital? I haven’t heard it called that since the early days in the 1970s when it was called Capital Radio and often went off-air at unexpected times. The reason given was that the cleaners would turn up and disconnect some vital piece of equipment so they could plug in the vacuum cleaner. Or maybe that is apocryphal, who knows? Anyway, Johnny’s off after eight years. Prior to joining Capital, Johnny presented Channel 4’s Big Breakfast show, which was felt to be close enough in format to a radio programme. He had also worked on the old BBC Radio 5 and on the top BBC station for London, GLR. This wasn’t the first time that Nile Rodgers has assaulted my ears this year. I heard the programme on BBC World Service this morning. ‘Outlook’ features ‘Extraordinary personal stories from around the world.’ And this week’s subject was Nile Rodgers. It is available here for a week: BBC World Service Programmes – Outlook, 14/11/2011. He is interviewed by Matthew Bannister on the occasion of the publication of his autobiography entitled ‘Le Freak: An Upside Down Story of Family, Disco and Destiny’. He did indeed have a very difficult upbringing which makes it all the more surprising, perhaps, that he could write fantastic, uplifting songs such as ‘Good Times’. Previously, in September 2011, my wife and I attended the Radio 2 Live in Hyde Park Concert, billed as ‘a festival in a day’. 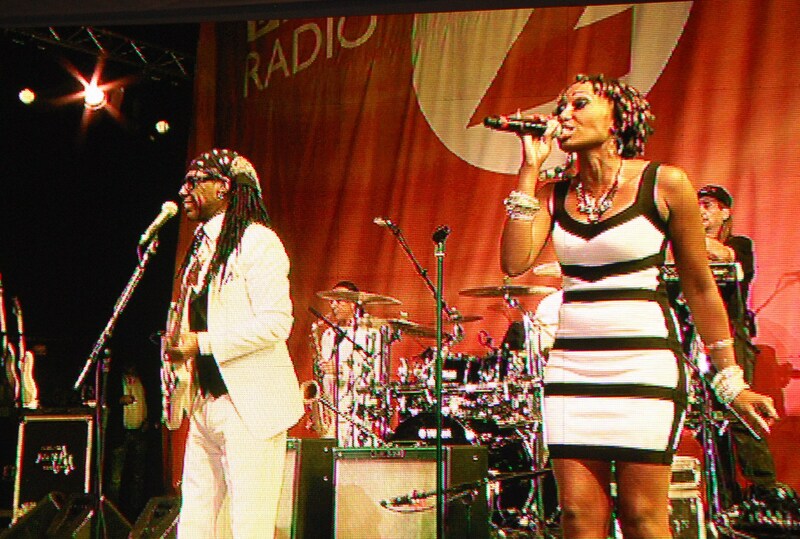 And amongst the artistes playing were Chic, featuring Nile Rodgers and his very distinctive guitar sound. Although the Sun was going down by the time they appeared on stage, they brought their own sunshine. And finally, here is Nile Rodgers again being interviewed by Lauren Laverne. Well, that’s very disappointing. ‘John Peel’s Shed’ is being recorded for radio tonight at the BBC Radio Theatre near Oxford Circus. I applied for a ticket at the earliest opportunity and didn’t hear anything, so I assumed they were over-subscribed. So that’s a little disappointing. But what is even more disappointing is that I have just received an email with my e-ticket. It was sent at 16:09 and I read it at 18:30. According to the ticket, doors open at 18:15 and recording begins 1t 19:15. There is no way I can get to this venue in time. And, to be honest, even if I’d received the email straightaway, it would have been a bit of a rush, to say the least: I live about an hour away from central London, if the trains cooperate. So, what am I missing? In 2002, John Osborne won a competition on John Peel’s Radio One show. His prize was a box of records that took eight years to listen to. The show, performed at Edinburgh Festival Fringe this year, ‘is an ode to radio, those records and anyone who’s ever sought solace in wireless. Adapted from his acclaimed book Radio Head, Radio 4’s Book Of The Week and featuring records previously owned by John Peel.’ I imagine tonight’s recording is a version adapted for future broadcast on Radio 4. Or maybe Radio 2. 6 Music? Anyway, I’ll be looking out for it. But what a shame my ticket arrived late. I’m hoping that my name is not now on some kind of BBC ticket blacklist! BBC 6 Music could have been offloaded to us, says Bauer boss | Media | guardian.co.uk. This reminds me of the time Alan McGee offered £20million to buy GLR from the BBC in 1999. I wonder now whether GLR could have been saved if we’d had the force of Twitter and Facebook behind us at that time?